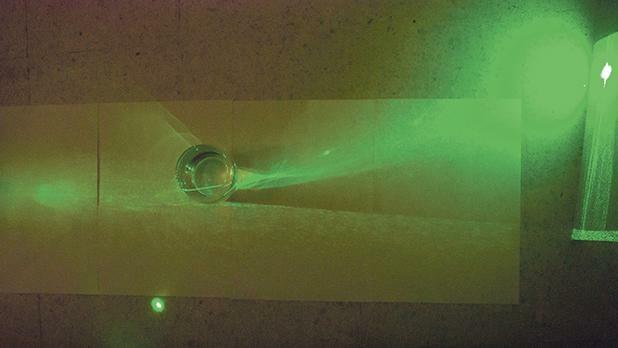 When laser light goes through a glass of water, the ray of light will undergo refraction and bending, subsequently changing the direction of the ray of light. Light has always played a crucial part in our lives. Already serving as the basis for a vast amount of technologies in our lives, every major breakthrough in understanding and controlling light enables future technologies. It is for this reason that this year, the Nobel Prize in Physics was jointly awarded to Arthur Ashkin, for “groundbreaking work in the field of laser physics” by inventing a tool of light, aptly named Optical Tweezers. Just as tweezers are used to deal with objects that are just too small for our fingers, optical tweezers were invented to manoeuvre extremely small objects such as atoms, particles, bacteria and other microscopic objects by using the light from a laser, dubbed as ‘laser beam fingers’. Imagine a glass of water that is being illuminated by a laser. The ray of light will enter and exit the glass, where it undergoes refraction and bending at the input and output faces, subsequently changing the direction of the ray of light. The effect on the glass can be explained by thinking of a game of billiards. The glass absorbs the impact and thus feels a force pushing in the opposite direction that the outgoing light is taking. However, light that hits the glass off-centre from one side it is deflected to the other side in contrast to colliding billiard balls. Here, the glass does not move because the forces that are generated by the ray of light upon its refraction and bending at the faces are minuscule. However, when the objects become smaller than the laser beam single light particles – so-called photons – become players in the billiard game. Once inside the laser beam, many photons will hit the object from all directions, pushing and eventually trapping it in the brightest part of the laser beam, its centre. This was the birth of the optical trap, which would later be known as optical tweezers. Although the trap was initially designed to capture atoms and molecules, Ashkin found that he could repurpose it to interact with small biological systems such as bacteria, viruses and even strands of DNA. Consequently, optical tweezers are widely used in microbiology due to their advanced precision. Researchers have built upon Ashkin’s work and studied how malaria parasites infect single blood cells in real-time. These insights into the infection mechanism may lead to new treatment strategies. There are still many areas and applications left to be explored with this tool of light, but for now, it has opened control over the microscopic world which we can utilise for the betterment of humankind in the spirit of Alfred Nobel. Wayne Jordan Chetcuti is reading for his Master’s in Physics at the University of Malta focusing on researching the role of quantum batteries in quantum information theory and quantum thermodynamics. Karl Andreas Pelka joined the Quantumalta group as a PhD student in 2018. He currently works on cooperative effects of light and matter with photon radiation pressure. • A single bolt of lightning is around five times hotter than the surface of the sun. • The irrational fear of lightning is known as keraunophobia. • There are two types of lightning, negative strikes and positive strikes. Positive strikes are five times more powerful than negative strikes. • The odds of being struck by lightning in your lifetime is one in 3,000. • Each second there are 50 to 100 cloud-to-ground lightning strikes to the earth worldwide. • The energy contained from a single lightning strike can power a 100 watt light bulb for 90 days. • Forget MRSA and E. coli. There’s another bacterium that is becoming increasingly dangerous due to antibiotic resistance – and it’s present on the skin of every person on the planet. A close relative of MRSA, Staphylococcus epidermidis, is a major cause of life-threatening infections after surgery, but it is often overlooked by clinicians and scientists because it is so abundant. • Osteoarthritis, a disease that causes severe joint pain, affects millions of people in the world. Some drug treatments can help alleviate the pain, but there are no treatments that can reverse or slow the cartilage breakdown associated with the disease. In an advance that could improve the treatment options available for osteoarthritis, MIT engineers have designed a new material that can administer drugs directly to the cartilage. The material can penetrate deep into the cartilage, delivering drugs that could potentially heal damaged tissue. For more soundbites listen to Radio Mocha on Mondays at 7pm on Radju Malta and Thursdays at 4pm on Radju Malta 2 https://www.fb.com/RadioMochaMalta/ .